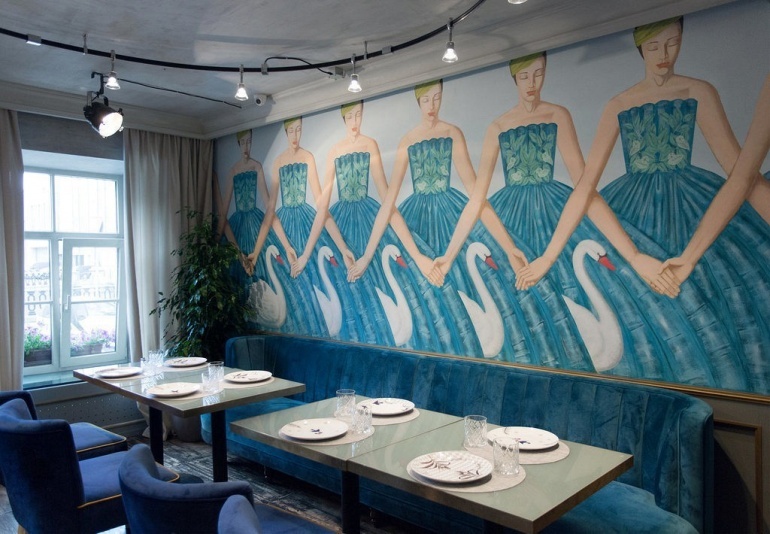 Ginza Project opened at the Theater Square in St. Petersburg restaurant The Repa with the interior of the Russian designer Alena Ahmadullina and original Russian cuisine chef Ruslan Stupitsky. "Behind the Scenes» Russian restaurant The Repa has opened on a plase of former famous restaurant. The name for the restaurant was chosen by chance: turnip - the oldest root in the world and the foundation of the diet of the Slavs, and in the theater so called rehearsal. The leitmotif of the project - "real kilometer", a principle that emphasizes the product, its place of origin, the manufacturer and technology. For example, the menu is based on authentic, seasonal organic products in Russia and the countries of the Customs Union. Russian designer Alena Akhmadullina was invited for the development of the interior The Repa. The main idea in the design of the restaurant was the combination of these seemingly polar elements as northern minimalism, theater fairytale imagery and super-modern forms. There are colorful mural painting inspired by Andrew Remnev. 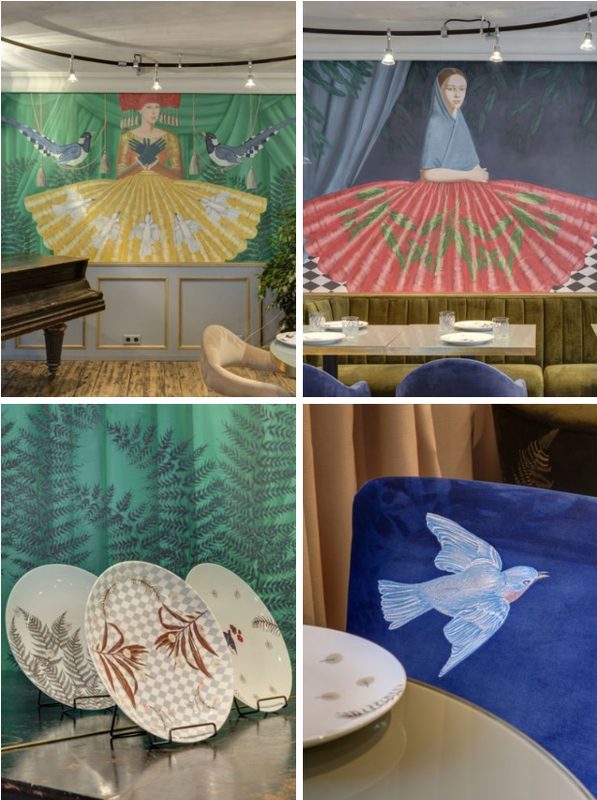 Furniture design also reflects this idea: succinct subjects coexist with complex, designed in fabulous style and mural elements continue in the form of embroidery on the seats and chairs. Creativity of Andrew Remnev was not chosen by chance: his manner of stylization of images, symbolism, many meanings that it conveys, seemingly static picture become the best way to express the meaning of the theater with the help of art. 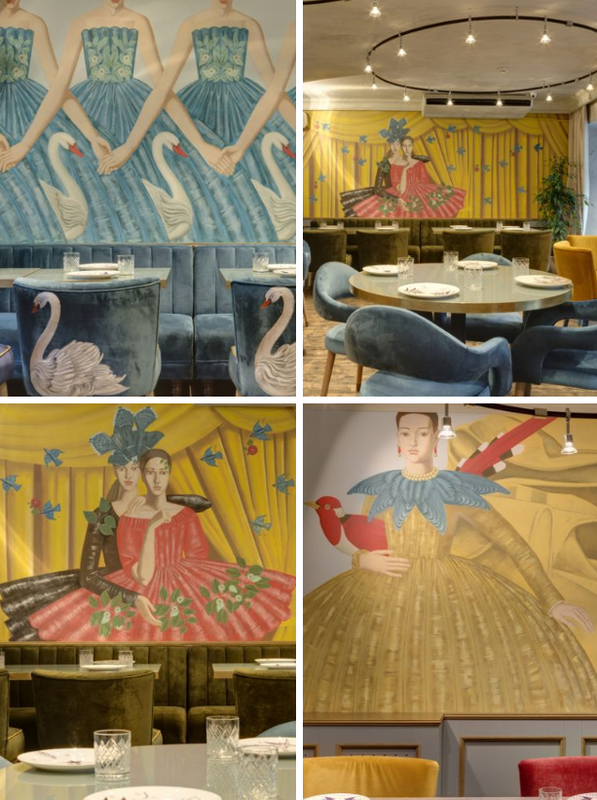 Inspired by the colors and stylistic devices of Remnev, Alena Ahmadullina has created her images, which have been implemented on the walls by artists from the Mukhin Academy. Cuisine restaurant headed by chef Ruslan Stupitsky known in St. Petersburg on the project "Green Door". The Repa menu consists of 30-40 dishes with accentuated seasonality, it is planned to update it every two weeks, adding seasonal ingredients. There is a table for 12 people in a separate room, which was planned to be held gastronomic dinners and tastings.